We are delighted to have a joint staff-student blog today to mark the beginning of LGBT History Month 2018. Bradley and Deb talk about their involvement in a Heritage-Lottery funded project, led by local LGBT+ support and resource organisation Support U in collaboration with Reading Museum and the University. 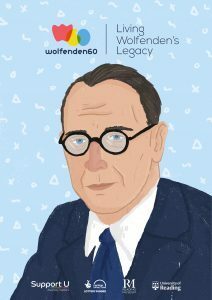 This project, Wolfenden60: Living Wolfenden’s Legacy, kicked off last year, the 60th anniversary of the 1957 Wolfenden Report (chaired by our then Vice Chancellor Sir John Wolfenden). To learn more see the events coming up at Reading Museum this month or our own UoR programme for LGBT History Month. The project not only involved the making of a documentary, but also several other aspects which I have been fortunate to be involved. This included a series of thoroughly interesting debates discussing representation of LGBTQ+ in the media, the state of unity within the community, and finally, one addressing the important question: who benefited from the Wolfenden Report? The documentary, in particular, has been such a fun experience. As a student of Film & Theatre who specialises in Theatre practice, I don’t have many opportunities to engage with filmmaking anymore, so to be able to participate in the filmmaking side – setting up the equipment, recording the sound etc. – was very exciting for me. Additionally, I spent a lot of time liaising with Kath, Jess, and the other volunteers around the content of the script, adjusting and editing it to make it accessible and coherent. I am a little sad that the documentary is almost finished because it has been fun working on it with everyone, and meeting all the friendly faces who got in front of the camera. That is not to say that the project hasn’t come with its challenges, especially with testimonies and finding people willing to share their stories on film. As Kath points out, “Many seemed unwilling to travel back emotionally to these difficult times,” but Jess notes that “We were still keen that we should share real life stories and experiences so we ultimately hit on the idea of asking for written submissions and have actors read these.” Even I read some of these testimonies for the camera, and though I had flicked through them previously, it wasn’t until I read them aloud, without any rehearsal, that the words really resonated with me on an emotional level. There was also a lack of testimonies from school age people and, to remedy this, Kath and Jess created some questionnaires for the members of the Affinity Youth group, one of multiple groups run by Support U, to offer a safe space for those who may have questions about their sexuality, who may not feel 100% comfortable with their sexuality, or anyone who just wants to form new friendships with people who identify as LGBTQ+. In the making of the documentary, we have had many individuals help us in the process: veteran activists Andrew Lumsden and Netty Pollard, our wonderful narrator Dan from 1stNature, the talented Jess Tuthill who recorded some original music and covers to accompany the documentary, and finally, Vicky from Lesbian And Gay Newsmedia Archive (LAGNA). I have also been able to be involved in the Wolfenden Project over recent months. Like Bradley, the experience has been transformative. To give some context, my ‘long’ working life included working as a school teacher at the time when Section 28 was put on the statute books and also when the infamous tombstone AIDS information campaign was on the TV and dropping through our letter boxes in the form of leaflets. These memories were revived when Caroline Crolla and I were working with Jess and Kath to develop educational resources about the ‘Legacy of Wolfenden’; we included a timeline of key historical LGBT+ landmarks alongside sessions on transgender identity that can be used in secondary schools. Other sessions draw on historical artefacts including Wolfenden’s interviews with Peter Wildeblood and a letter written by Jeremy Corbyn in the 80’s. These educational resources show how there is a real positive legacy of Wolfenden, one that is continuing to develop and progress. For me, it has led to reflection on how society has changed over the course of my working life and how that change is in small steps forward and sometimes small steps back. However, the fact that I am an LGBT+ workplace role-model and a Face of Reading is something that I would not have believed possible when, in 1988, guidance was received in school on the implications of Section 28 on our work with children. Like Bradley, I became involved in the filming of testimonies for the documentary; it was lovely to work with students from FTT and see them work with confidence and expertise to get the best out of me – sat on the biggest pile of cushions I have ever seen! I read some testimonies of young people and it was striking that the pain and fear of coming out has not changed much; the individual journey can still be difficult despite society apparently being more accepting. There is still transphobia and homophobia and it is important not to assume that now we have gay marriage it is all OK. To tell your Mum and Dad, your grandparents and those you are at school or at work with is not an easy task. A voice in your head will be telling you that things will never be the same again and potentially will be ruined. This is why it is important we have strong and outspoken allies who are willing to speak out and not be bystanders particularly for the youngest and most vulnerable in our communities.